Ack! We’re back from the cottage (sorry, I forgot to take more wallpaper photos) and it was blistering hot here, too hot to sit on the deck so I ventured down into the lovely cool, tidy basement. I had to add “tidy” in there because I cleaned last weekend and haven’t done anything since. 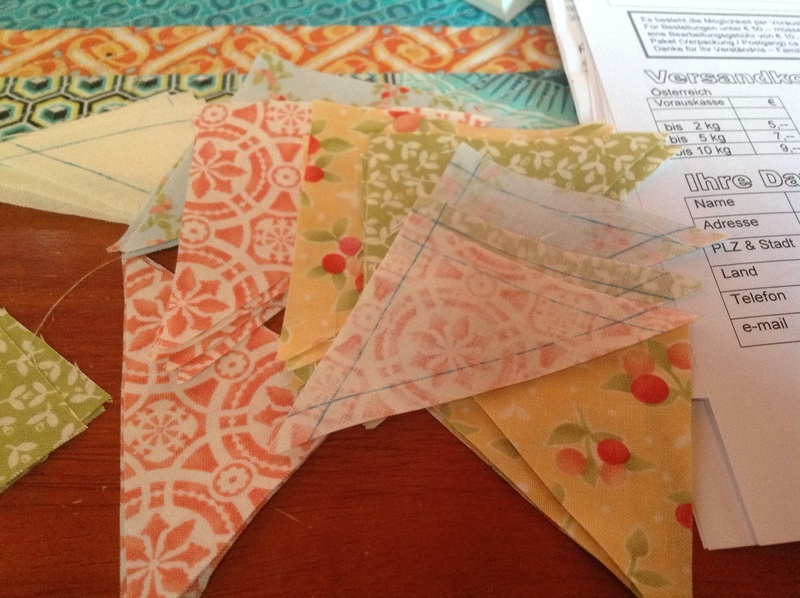 After flipping through the Zakka Style book and folded some laundry, I thought I’d use Robert Kaufman’s vanilla linen and California Girl (by Fig Tree) to make a card trick block. Much cutting later and I still don’t feel like sewing. Ug. Thankfully the temperature has dropped and we can sit outside again. White wine spritzer anyone? Such delicious fabric, why don’t I want to sew?? Is it a seasonal thing? This entry was posted in Fabric, Fig Tree Quilts, Mojo and tagged Linen, Robert Kaufman, Zakka Style by Tabatha. Bookmark the permalink. Tabatha, I know how you feel! I have all kinds of sewing projects lined up beside my machines waiting, but no mojo! I am however, finding myself busy in my garden considering a landscaping project to tackle before fall and enjoying the warm weather and flowers that come with it. Hi Tabatha, it is something that happens to all of us so don’t worry. In the mean time do you feel like making a review for your Bernina machine on the things you like and don’t like? I just loved the one you did on your Juki.